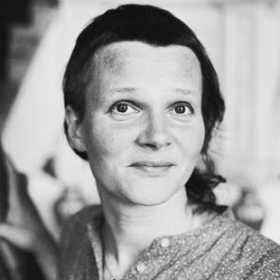 How and when did you become head of design at Albert Bonniers Förlag? In 2005 after I had freelanced for 11 years. Before that I had worked with a lot of different publishers and also taught graphic design at Konstfack University Collage. I think my educational experience was one of the reasons they asked me. Before that the position didn’t exist, but there was a need at the time to raise the level of design and ease the communication between the publishing house and external designers. 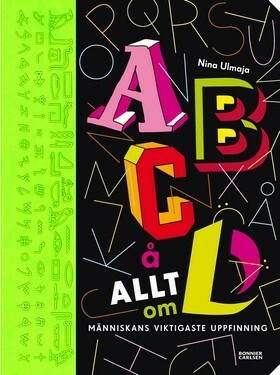 August Award winning childrens book about the history of the alphabet. Written, designed and illustrated by Nina Ulmaja. Bonnier Carlsen, 2012. What does your position mean and what were the challenges when you started? Honestly, I didn’t really know what I was getting myself into. I was supposed to form the position myself. It wasn’t easy, but I immediately saw some things that could be improved, like the work processes and the knowledge of the client. One of the things I stated early on was that we have to be professional and more constructive towards the designers, knowing more or less from the start what we do or do not want as well as ending collaborations that doesn’t work. The final result – the book – is what matters. The books have to look like they’re made today and not ten years ago. A big part of what I do is acting like a sounding board, both internally and externally. I’ve significantly raised the level of knowledge regarding design and typography at Albert Bonniers Förlag. The design part isn’t something that you think of at the last minute anymore. I regularly work with trend forecasting and I’ve held courses internally in readability and how to achieve good typography in practice. 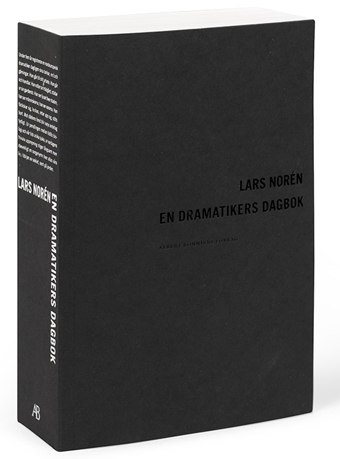 En dramatikers dagbok, Lars Norén, Albert Bonniers Förlag, 2008. It was hard to show what I wanted to do and get credit for it during my first year. People didn’t really understand what a head of design does. The idea that the designer comes in towards the end of a project and makes the final touch was deeply rooted. Now the designers get onboard early in the process, sometimes when an author comes up with an idea, that is, before the book is even adopted. This is to get a better idea of what a book it could be. I got involved in processes where you probably didn’t expect me to, such as how we outsource jobs, choose designers for specific assignments and what information the designer gets when we contact them. Still, improvement is a long-term work in progress. 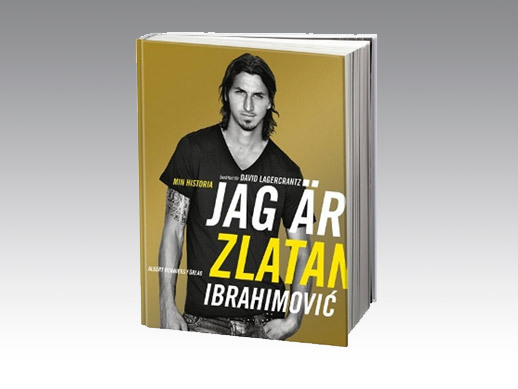 Jag är Zlatan, Albert Bonniers Förlag, 2011. What are the pros of having someone as head of design and why don’t all publishing houses have? I hope that you can see from our releases why it’s good to have someone that is responsible for the design. That person keeps the publishing house up to date on what’s going on in the world of book design and typography. And all companies want to be at the forefront of their field, right? It was daring of Bonnier to hire someone as head of design six years ago. Innovative and cool for a 170-year old publishing house! It seems like more and more publishing houses start to understand the benefits of having a design savvy person. Just like all other manufacturing companies have done a long time ago. Books are books, but also products. 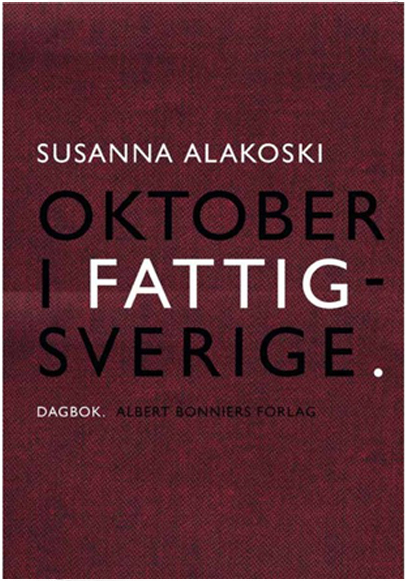 Oktober i fattigsverige, Susanna Alakoski, Albert Bonnier Förlag, 2012.